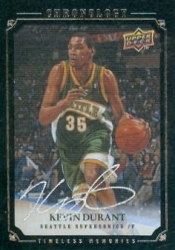 Kevin Durant rookie cards are among the most coveted in the hobby and interest increased when he made his move from the Oklahoma City Thunder to the Golden State Warriors. 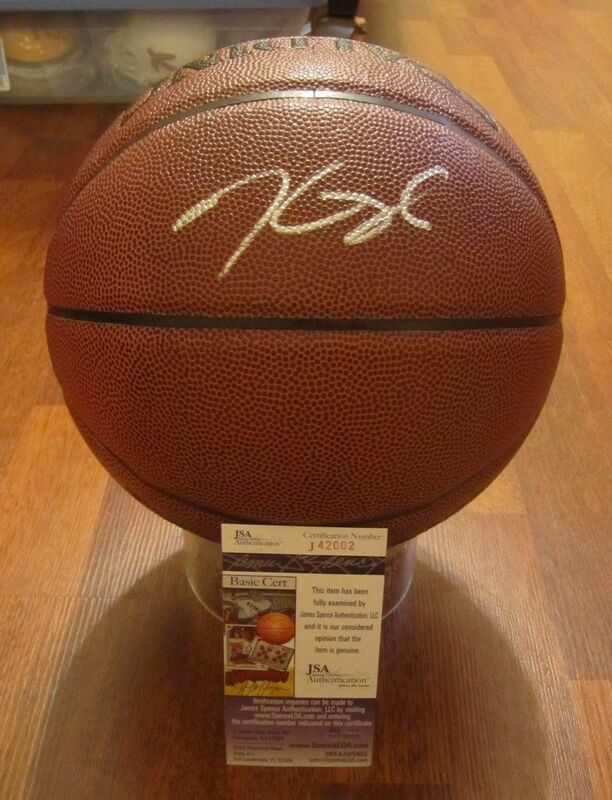 Kevin Durant cards and memorabilia represent an investment opportunity for collectors but the cost of entry keeps pushing higher. Given the success he has already achieved, prices for Kevin Durant cards and autographs are a safe bet for continued improvement. It is also important to note that Durant has an exclusive autograph deal with Panini. 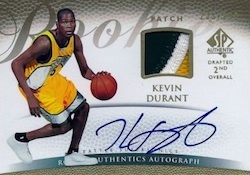 However, when he entered the league in 2007, Durant had an agreement with Upper Deck. Those are two great places to look for authentic autographs and memorabilia. 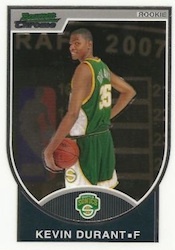 Durant has a total of 32 true rookie cards, which fall into all price ranges. 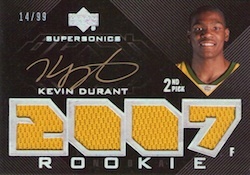 The top three Kevin Durant rookie cards all feature on-card autographs and jersey patches. We also have an expanded look at the best KD rookies. Anytime a player has an Exquisite rookie card, it is normally their top card. Kevin Durant is no exception. Numbered to 99, it is the top option for any Durant collector. The card is further highlighted by an on-card autograph and jersey swatch. Although it is unfortunate Seattle lost their franchise to Oklahoma City, the team colors are unlikely to be missed. The patch is a little smaller and the card is numbered to 299, but the SP Authentic card is still hotly pursued by collectors. 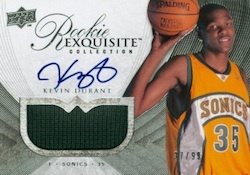 Due to the higher print run, they are some of the most widely traded, high-end Durant rookies. The UD Black card features a huge swatch that spells out "2007" and is also numbered to 99. Understandably, the color scheme is heavy on black. Contrasting nicely is the on-card autograph signed in gold. 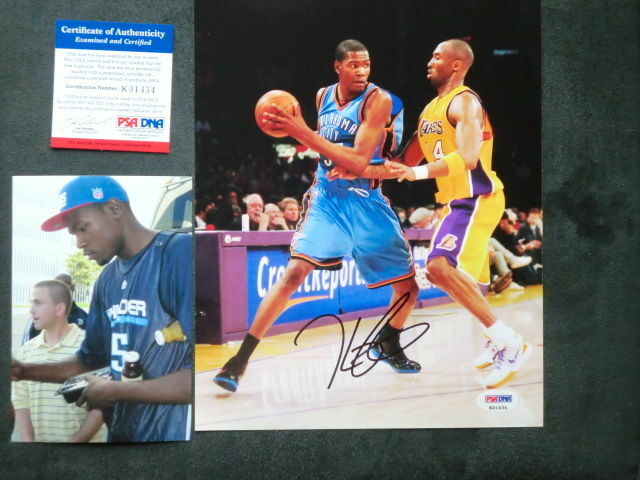 2012-13 Intrigue Slam Ink Kevin Durant Sealed Redemption Gold Auto 08 10!!! 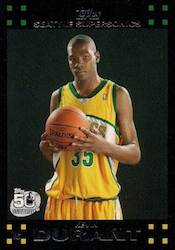 Topps 2007 Kevin DURANT ROOKIE WHITE PSA? 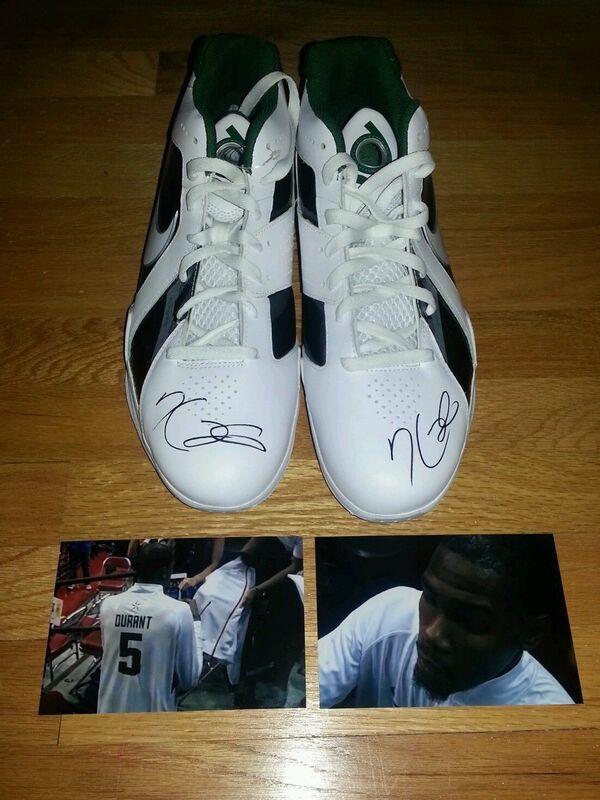 Below you will find an example of what Kevin Durant's authentic signature looks like. This can be used as a first point of reference for determining the legitimacy of autograph memorabilia, but is not a substitute for having your items authenticated by a well-respected professional autograph authentication company. Reputable authentication companies include JSA, PSA, Panini Authentic, Upper Deck Authentic, Tristar and Mounted Memories to name a few. Click on any of the images below to view full size photos. Signed on a light upward horizontal plane of about 15 degrees. The letter "K" is legible which includes a tail back and to the left. The letter "D" is also visible, it is not closed but includes a small, curved tail on the top left of the letter. The remaining character looks like a sideways heart shape drawn in a manner that the character looks like wings. 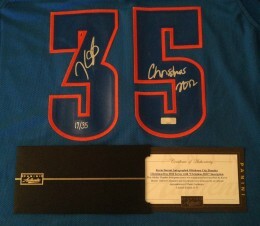 Kevin Durant Signed Nike Swingman Jersey "NBA Champ" Insc LE to 135 Panini. 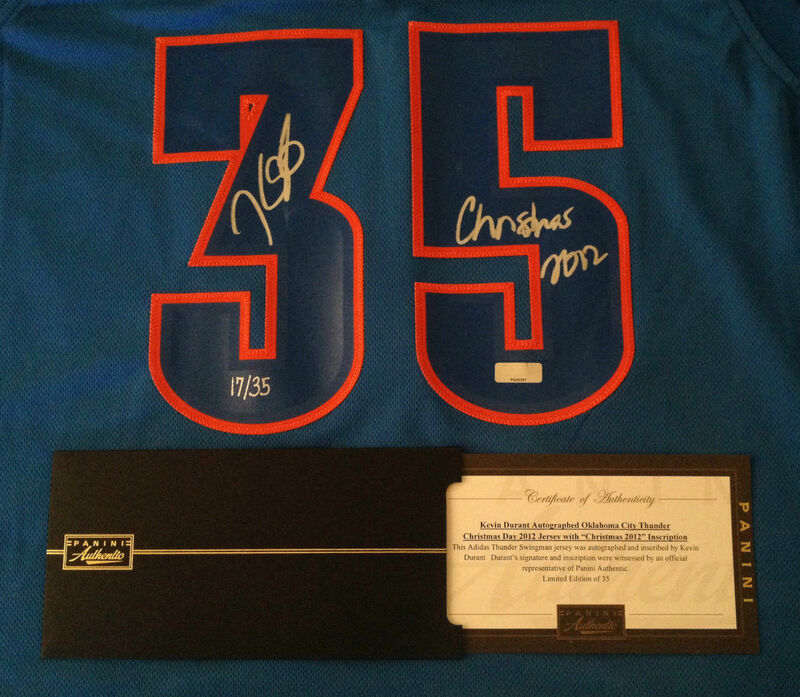 I have a Thunder Book Bus bookmark autographed by Kevin Durant…how much would something like that go for?